Collagen and elastin are the two building blocks of our skin. As we age they breakdown and our skin starts to sag and wrinkle. This process starts in the 20's and really can start to be noticeable in the 40's or 50's, depending upon genetics, sun damage and skincare. I am 47 years old, about to turn 48 and because I stay out of the sun, have good genetics and take care of my skin, I look like I'm in my 30's. The Collagen Glow is a lifestyle guide and cookbook using collagen. It is packed with 40 delicious recipes to show how versatile collagen powder is. In addition, it has all of the answers to the questions you have on collagen: how it is harvested, what its benefits are, and how to take it to the next level with an easy 10-step plan. Collagen will make your skin and body look and feel better. The book was written by the founder of Crushed Tonic skincare supplements. One thing I count on to help me is collagen supplements. And lately I have noticed more nutritional versions of supplements coming out that are really good for you. One I tried and reviewed is Crushed Tonic, which was founded by the author of the book I am reviewing today, Sally Kim. She wrote The Collagen Glow: A Guide To Ingestible Skincare. Last month I tried the Sample Kit from Crushed Tonic and loved it. I want to try the Turmeric Crush now and use it for about a month at least. I found that it worked well in smoothies. I used one of the smoothie recipes from this book. It was amazing. Best smoothie I have ever had in my life. Then I tried the Matcha Crushed Tonic and made another smoothie. Awesome. I am loving homemade smoothies, as they are so much better for you than smoothies from fast food places. 1. Mix Turmeric Crushed Tonic and 1 Cup Almond Milk on Puree in the Blender until well blended. Try and make sure there are no clumps. 2. Add frozen raspberries and slice chunks of frozen bananas into blender to blend nicely with almond milk/crushed tonic mixture. 3. Add to cup with straw and enjoy the benefits of getting your marine collagen + probiotics + antioxidants + superfoods. This is why having the 'special' crushed tonics are important, they provide special antioxidants or superfoods, that in the main crushed tonic. Crushed Tonics provide probiotics, collagen and antioxidants. I like the one with turmeric. I think it benefits skincare the most. it helps fight off inflammation and and anti-aging together yet they don't cancel each other out. I also like making smoothies with organic Greek yogurt and some juice but I have been drinking almond milk and love it. It has a lot of calcium but very little protein in it, so you need to make up the protein somewhere else. Place all the ingredients, except the chips, in a blender and blend. Add the almond milk as you go. Add more almond milk or water depending on desired consistency. Pour the mixture into a bowl, pour in the chocolate chips as a garnish and mix in for additional texture. Use on top too with sliced bananas. Eat in bowl as dessert. This item I varied in what I had but it was good. I had almond butter so I used that and I couldn't find stevia flavored chocolate chips so I just used a few chocolate chips. You can also make foods like Rose Water Tonic, that are more elaborate. These require having more than just Crushed Tonic on hand, but things like collagen powder. Kim has a chapter of "10 Korean Skincare Tips My Grandmother Passed Down To Me". In this chapter her grandmother reinforces the necessary washing of the face, exfoliation of the face, chooe fruits over sugary desserts, stay hydrated with water & tea, sunblock, sunblock, and sunblock. Those are just to name a few. I will definitely reiterate sunblock. My face is covered in SPF40 everyday and has been since I was at least 20. I look like I am in my 30's when I am going to be 48 in April. I do need to lose weight yes but other than that I look pretty good for my age. Water is another must too, Staying hydrated with water is important, as is laying off the alcohol. Kim has a 30-Day Challenge: The 30 Day Korean Skincare Diet. She says that, "America's obsession with beauty, aging and is overrated. She says aging is not a crime, but a natural process, and that beauty exists in all ages and forms." Most people don't realize that their skincare problems start with nutrition at the core of the issue..., Which implies that eventually it gets expelled into the skin. "A typical day would be a collagen drink before breakfast. For breakfast turn to healthy fasts and carbohydrates, Avocado toast. Avoid any pastries, jams, breads, and butter. For lunch turned to steamed fish such as salmon, some roots, vegetables, cup of brown rice. Steaming eliminates the need for butter, while salmon gives you healthy fats that keep skin healthy and plump. For dinner, exercise portion control, be the pickiest you can be and the farthest you can from fried foods, sugary desserts and dairy based drinks...." And there is still more to the diet. I mean it is crazy. But good for the skin. There is also a chapter on the study of collagen in different areas of the body, especially in the joints and also a chapter on which foods would be best to eat for your best skincare benefits. All in all, it is a great book. I loved the crushed tonics and I think Sally Kim really did a good job of researching her love of collagen and collagen diets, skincare and how to promote a more youthful diet in skincare and bodycare. I would ask a nutritionist first before following her diet. Just to make sure that you are not hurting yourself. Her diet is very restrictive. To try a Crushed Tonic go to Crushed Tonic. There is lucuma flavor (plain), turmeric flavor and matcha flavor. 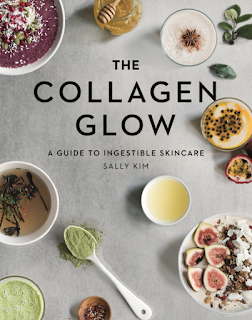 This book, The Collagen Glow: A Guide to Ingestible Skincare is also sold there but only if you are going to be going to booksingings. It can also be found at Barnes & Noble, www.amazon.com and Target stores. Like Crushed Tonic on Facebook: https://www.facebook.com/crushedtonic/ and Follow Crushed Tonic on Instagram: https://www.instagram.com/crushedtonic.